For those of us who've been following Apple for a while, Steve's resignation as CEO was expected, but it was still a sudden surprise. 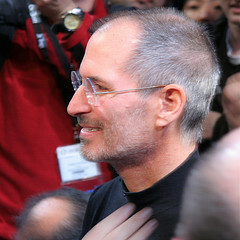 Twice at the helm of the company he co-created, Steve took on mediocrity, short sighted tech pundits and endless betas to create integrated products with elegant industrial design and software that just works. Customers rewarded his company for it with fierce brand loyalty, and his competitors employed their sincerest form of flattery. Love or hate his company, but you can't ignore it. I wish him the best at his new position at Apple, and hope it allows him to focus more on his health and his family who love him, both of which are more important. Peace.